Single strand copper wire features a 3 mil PFA insulation which is excellent for vacuum and has a temperature rating from -267 to 260 °C (-450 to 500 °F). OMEGA’s thin-wall covering process guarantees continuous lengths up to 1,000 feet. 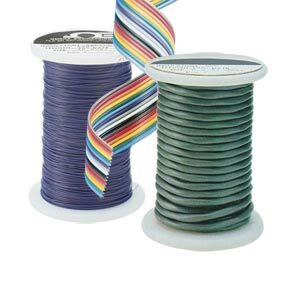 This wire is ideal for connecting strain gages to solder terminal strips and pads. OMEGA’s ribbon cables are PVC pre-insulated conductors laminated to a clear PVC film to allow easy termination. The color coding allows quick identification and circuit tracing. The multi-conductor ribbon cable can easily be trimmed to any desired conductor width for different uses. The PVC insulation is rated for temperatures from -40 to 105 °C (-40 to 221 °F). Shielded cable provides the high conductivity and noise immunity required for instrumentation hookups to transducers. It is suitable for low and high level voltage signals and mA pick-up in high EMI/RFI environments. The PVC insulation is rated for temperatures from -40 to 105 °C (-40 to 221 °F).